How do I contact YouCanBook.me support? The YouCanBook.me Customer Success team is small but knowledgeable and we're happy to help! We're not able to offer email support to our free users, but we have a wealth of information in our Knowledge Base. Paid users can contact our Customer Success team directly from their account. Just login and click on the Get Help in the top right corner and we'll get back to you as soon as we can. 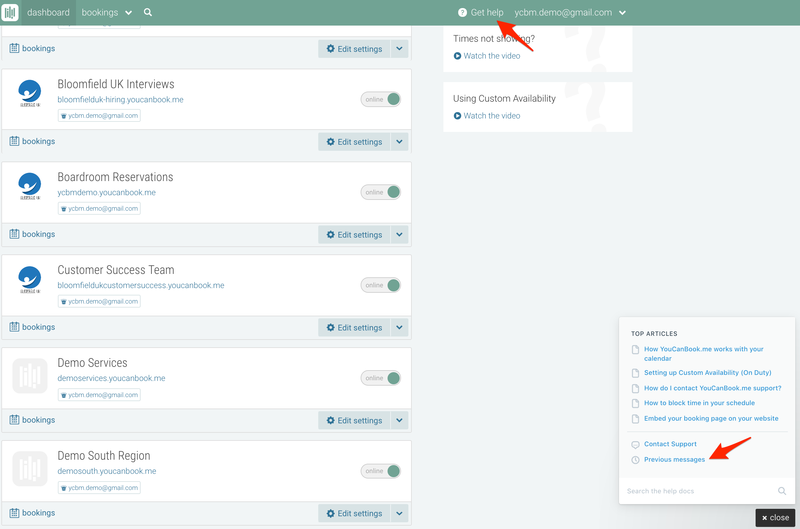 As much detail about your issue that you can provide is appreciated, including which booking profile you are working with, and any screenshots of your linked calendar. We will send our response to your account email address, but you can also find our reply by clicking previous messages. We have team members in Europe and the US and our response time is usually 4-6 hours during working hours Monday-Friday. Why doesn't Youcanbook.me offer phone support?